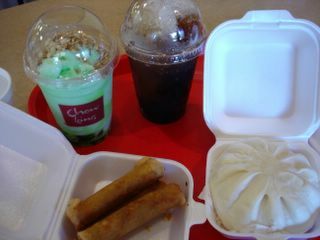 On our way to visit a friend last Saturday, we stopped by Chowking to grab a quick bite to eat. Since it was shaping up to be a scorcher of a day, I was also craving something cold to cool my gullet. I got a Buko Pandan shake ($2.95). This chilly green concoction was made with ice blended into a slush with coconut milk and pandan extract, some green pandan jelly and a sprinkling of pinipig. What a fun word to say. Pinipig is simply pieces of crisped rice, with a toasted, nutty flavor. It brought this slushy drink an added dimension of texture. However, it was the pandan, which has a creamy vanilla-like flavor and aroma, that was the star of the drink. We also got the Gulaman drink ($1.75). A simple mix of cooling black grass jelly, brown sugar syrup, ice, and white sago (tapioca pearls). Refreshing! To munch on, we ordered some siopao ($1.65 each). The chicken siopao, was a steamed bun filled with a firm chicken mousse. The mousse contained a piece of sweet Chinese sausage and a quail egg. Biting into these hidden morsels was like finding the prize in a Cracker Jack box. The pork siopao had shredded pork in sweet dark sauce. A dollop of asado sauce per bite made the experience complete. We also ordered some egg rolls (3 pieces for $1.95). They were good. Slender and long in shape, they were served crisp and hot, fresh from the fryer. Perfect with a dip in the Filipino sweet and sour sauce. Blogger deleted part of my post (now corrected) but you should try the sashimi salad from the japanese joint in HK. Also, have you checked out that Pho place my greek island? I've been meaning to head there for lunch but thought maybe you could tell me whether its worth it. Thanks for the tip on the sashimi salad. Sounds delish. I've been to the Pho place next to Greek Island Grille, but I think it was when it was called "Mekong Flavor". It seems to me the name has changed (or has it?). If it has, then my opinion is moot, but I remember the pho that I had there to be very salty, and overly MSG'd. I also remember it was expensive to boot. I've never been back since. BTW, there's a Pho 99 on Harbor near Baker that is pretty good. I used to go there a lot and it's close enough the South Coast Plaza area. we went to chowking and order their beef wanton soup which was super oily with 5 piecs of tiny dice like beef and order their dimsum siomai which was around 1.98 and when we got our order I almost fainted because it was only a little bit bigger than a large grape, smantala in some of the dimsum place in diamond bar they gave you 4 siomai which is 3x Chowking dimsum siomai and less than l.50 0n weekdays. And halata na their siomai is from those frozen siomai that you could buy in 99 ranch kasi it's a little bit meat and full of flour.